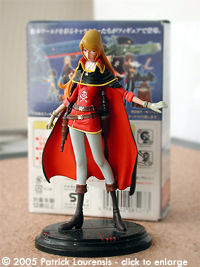 Coming mainly from Japan, trading figures quickly became all the rage. 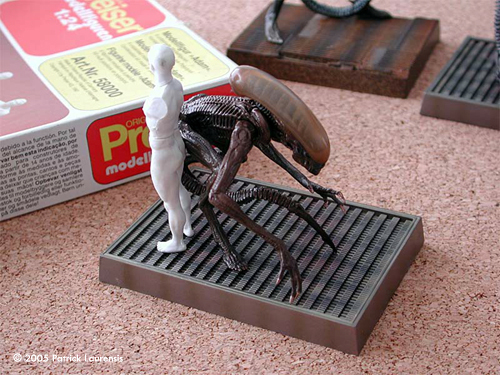 It is now time for sci-fi modeler to consider the value of these figures as they regard our hobby. 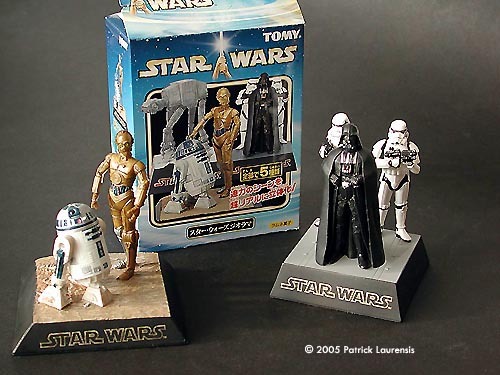 Many sets are dedicated to anime from Japan, but there’s also many sets about Star Wars, Star Trek, Gerry Anderson worlds, Aliens, real space,... 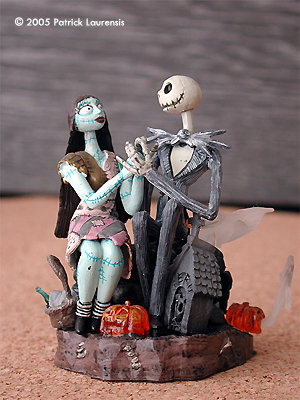 Okay, now I have your attention. 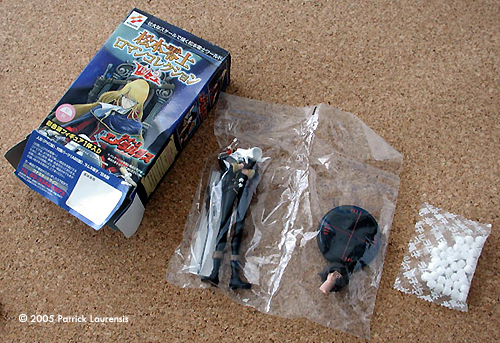 Some are distributed as candy toys (shokugan), others as capsule toys (gashapon). It is impossible to make a complete list of the released items, they are far too numerous. 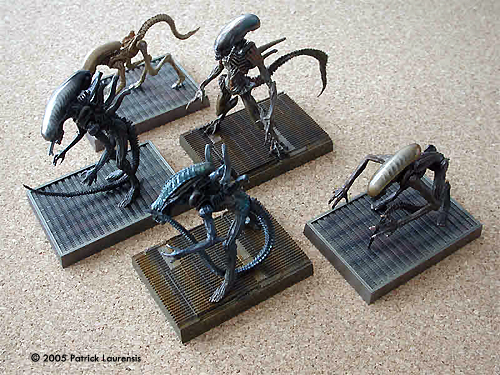 Produced as merchandising, those prepainted collectors are produced in limited quantities and quickly out of stock. 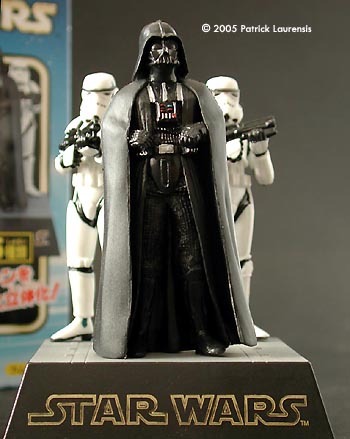 Image: Closer look at Vader & Co.
Last but not least, they are randomly packed and you don’t know wich one of the set you will receive in your box . In other countries than Japan, retailers are distributing those candy boxes, often not so regularly, and at higher prizes, because of importation business. 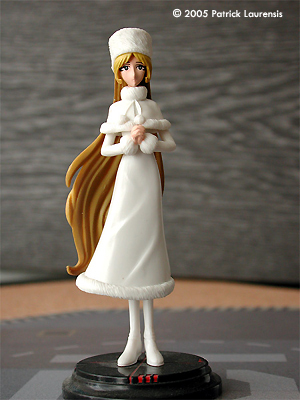 An Interesting fact is that some are unpacking the figures and displaying them to be sold separately, during meetings, shows, conventions, old toys or modeling fests, etc... to please customers of the very specific manga fan market. Prises are higher, but you grab only the ones you wish, without the risk of buying randomly packed items. 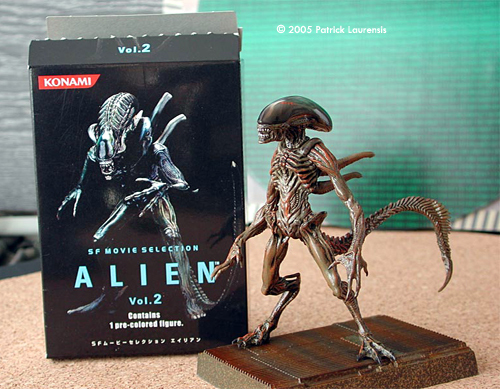 Sometimes, one owns a complete set, with the "rare or "secret" extra item, and won’t sell a single figure out of it easily! 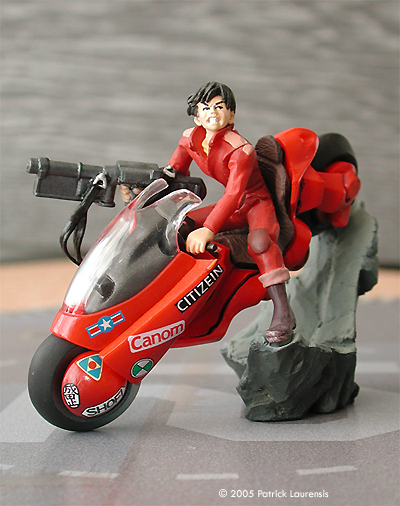 Best sellers are sometimes awarded with special re-editions and then can be ordered, as the ultra famous red bike from Akira anime. But late editions feature some differences with the original one, which becomes more valuable as collector item. Anyway, the hardore fan will probably want to buy every edition of the little beloved thing! 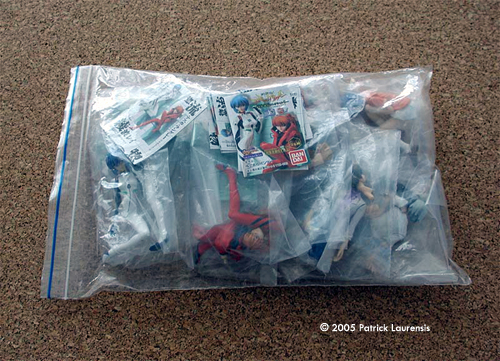 If large stock of models from some famous set are available, people in business may manage to fix a limited amount of "complete set" bags. It’s a kind of cool childish treasure hunt, building relationship with a retailer who has the "secret contacts", claiming he or she travels to Japan to keep things rolling. He - she will try to help finding things or make a special prize for a good client like you ... maybe. In any case, prises announced by various merchants and resellers should be examined with extra care. Is it worth while? 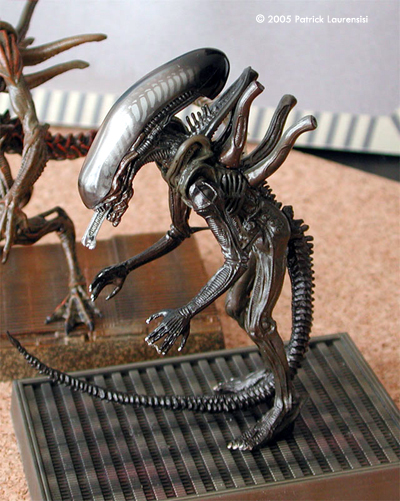 Budget solution compared to some resin statue or rare garage kits. Some subjects are really hard to find or does not exist in any other media. 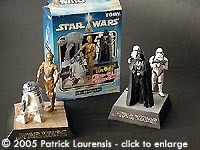 At left are some images out of my personal collection, which I consider being typical of interesting characteristics you can find in trading figures. The figures out of various "Captain Harlock" - "Galaxy Express" anime shows capture with excellent feeling the character design, especially romantic long haired space ladies wich are so typical to Leiji Matsumoto job. 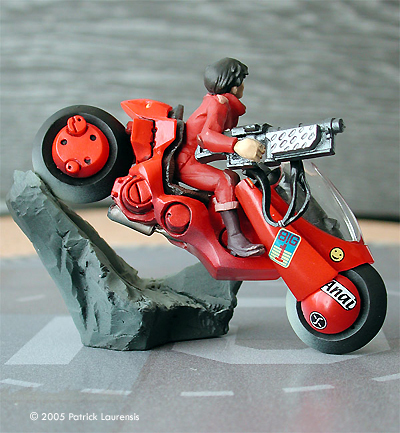 The biker from "Akira" is a late re-released scale model, so the figure is not so like young Kaneda from the movie, but the machine is very satisfying. The quality of printed logos is surprising. Part of "Ghost in the Shell - Standalone Complex" set, the muscle of section 9 demonstrates excellent fidelity to the characters. Even the guns are the right ones. 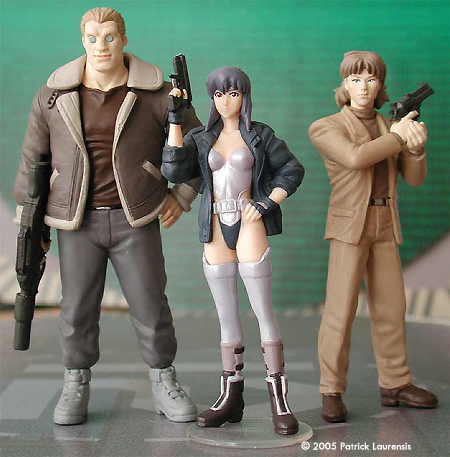 Major Kusanagi handles her HP like the real professional: the finger rests on pistol handguard, not on the trigger! 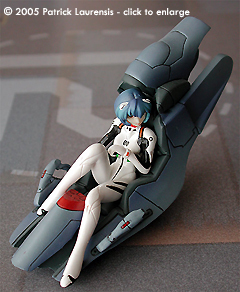 Rei Ayanami is often seen as resin statue of the perfect little dream girl, wearing Santa suit, sudent suit, nurse suit, evening suit, swim suit or ... whew ... no suit at all. In the image at the top of the page she wears for a change an authentic outfit from anime "Evangelion" and offers an extra, rare opportunity to see a mecha pilot installed in the office inside that huge metal beefcake. An excellent addition to be displayed with your Master Grade mecha. Trading figure sets are an inexpensive way to obtain scale reproductions of favorite characters, vehicles and creatures - many of which exist in no other medium. 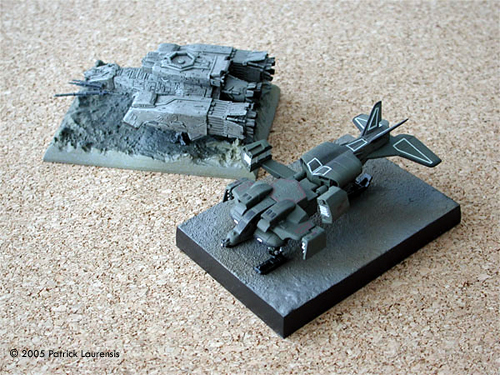 They can be displayed as-is, repainted and detailed like any other model, or even incorporated into a model, vignette or diorama. They are really very much worth looking into. Many thanks to Patrick's wallet for providing the review samples. Manufacturers and retailers, interested in getting your wares reviewed and publicized on a site averaging 3500+ readers a day? Contact us!